HomeProducts Mod Podge ® Mega Glitter - Silver, 8 oz. Enhance your projects with an intense glitter finish with a shimmering, lustrous shine. Layer coats for dramatic sparkle. Dishwasher safe. Works well on jewelry, fashion accessories, decor projects and more. On what type of surfaces can I use Mod Podge Mega Glitter? 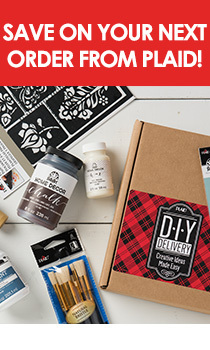 Mod Podge Mega Glitter can be applied directly onto a variety of surfaces, including the following: wood, tin, terra cotta, canvas, papier mache, glass or ceramics (glazed or bisque), and even rigid plastic. Do I need to shake Mod Podge Mega Glitter before using? No, shaking the bottle prior to use may introduce air bubbles. Although it's not typically necessary, Mod Podge Mega Glitter can be stirred before use to incorporate the product fully. How long after application will Mod Podge Mega Glitter be fully cured to the project surface? Mod Podge Mega Glitter will be fully cured to a project surface 28 days after the last application was made. Is Mod Podge Mega Glitter dishwasher-safe? Yes, dishwasher-safe glass and ceramic surfaces decorated with Mod Podge Mega Glitter can be washed on the top rack of the dishwasher. Non-dishwasher safe surfaces should be cleaned carefully using a damp cloth. Where can I learn more about Mod Podge Mega Glitter? You can learn more about this product by reading the complete Mod Podge Mega Glitter FAQ. Mod Podge ® Acrylic Sealer - Pearlized, 11 oz.